Landlords – Housing & Credit Counseling, Inc. 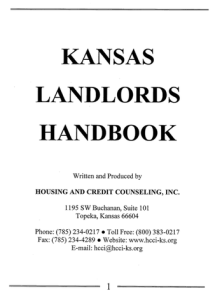 The Kansas Landlord Handbook provides useful, practical information regarding the communication and business relationships between tenants and landlords. Download the entire book by purchasing the book at the link below. You may also click the links to the right to select specific topics. KHRC hosts a FREE on-line service where Kansas landlords can list their available properties. The Kansas Residential Landlord and Tenant Act (KRLTA) governs the relationship between landlords and tenants in Kansas. Laws in your state may be different. The Kansas Mobile Home Parks Residential Landlord and Tenant Act applies to landlords who rent lots to tenants who own their own mobile homes. Laws in your state may be different.